In this paper we introduce two new classes of mappings called B&delta;g-homeomorphism and B&delta;gc-homeomorphism which are defined using B&delta;g-closed sets and study their basic properties. We also investigate its group structure of their subgroups. We also investigate its relationship with other types of mappings. Arya S. P. and Nour T., "Characterizations of S-normal spaces", Indian J. Pure. Appl. Math., 21(8)(1990), 717-719. Devi R., Balachandran K. and Maki H., "On generalized-continuous and generalized continuous functions", For East J. Math Sci. Special Volume, Part I (1997), 1-15. Dontchev J., "Contra-continuous functions and strongly S-closed spaces", International J. Math. Sci. 19 (1996), 303-310. Dontchev J. and Ganster M., "On -generalized closed sets and T3=4-spaces", Mem. Fac. Sci. Kochi Univ. Ser. A, Math., 17 (1996), 15-31. Dontchev J, Noiri T, "Contra-semi-continuous functions", Math. Pannonica 10 (1999), 159-168. Ganster M., Reilly I. L., "Locally closed sets and alc-continuous functions", Internat. J. Math. Sci. 3 (1989), 417-424. Lellis T. M., Meera D. B. and Hatir E., bg-closed sets in Topological spaces", Gem. Math. Notes, Vol 1, No.2, (2010), 17-25. Lellis T. M., Meera D. B., "Some new class of generalised continuous functions "Proceedings of the ICMCS2011, 431-434. Lellis T. M., Meera D. B., "Notes On Homeomorphisms Via bg-Sets." Journal of Advanced Studies in Topology, Vol.2, No.1 (2011), 34-40. Lellis T. M., Meera D. B., "Notes on contra via bg-continuous functions", Bol. Soc. Paran. Mat Vol. 30 No.2, (2012), 109-116. Levine N., "Semi-open sets and semi-continuity in topological spaces", Amer. Math. Monthly, 70 (1963), 36-41. Levine N., "Generalized closed sets in Topology", Rend. Circ. Math. Palermo, 19 (2) (1970), 89-96. Maki H., Devi R. and Balachandran K., "Associated topologies of generalized -closed sets and ®-generalized closed sets", Mem. Fac. Sci. Kochi Univ. Ser. A. Math., 15 (1994), 57-63. Mashhour, A. S., Abd El-Monsef, M. E. and El-Debb. S. N., "On precontinuous and weak precontinuous mappings", Proc. Math. and Phys. Soc. Egypt 55 (1982), 47-53. Malghan S. R., "Generalized closed maps", J. Karnatak Univ. Sci., 27(1982), 82-88. Meera D. B., "Investigation of some new class of weak open sets in general Topology" PhD Thesis, Madurai Kamaraj University, Madurai (2012). Munkres J. R., "Topology, A first course", Fourteenth Indian Reprint. Njastad O., "On some classes of nearly open sets", Pacific. J. Math. 15(1965), 961-970. Noiri T., "Super-continuity and some strong forms of continuity ", Indian J. Pure. Appl Math., 15 (1984), 241-150. Noiri T., "On continuous functions", J. Korean Math. Soc. 18 (1980), 161-166. Ravi O., Lellis T. M., Balakrishnan M., "Quotient functions related Ekici's a-open sets", Antarctica Journal of Mathematics, 7 (1) (2010), 111-121. Starum R., "The algebra of bounded continuous functions into a nonarchime-dianeld", Paci¯c J. Math, 50(1974), 169-185. Tong J., "On Decomposition of continuity in topological spaces", Acta Math. Hungar, 54 (12) (1989), 51-55. Veera K. M. K. R. S., "bg-closed sets in topological spaces", Bull. Allah. Math. Soc., 18 (2003), 99-112. Velicko N. V., "H-closed topological spaces", Amer. Math. Soc. Transl., 78 (1968), 103-118. ISNAD Jeyapackiam, Jeyasingh Juliet , Asir, Alwyn . "B&delta;g-Homeomorphisms". 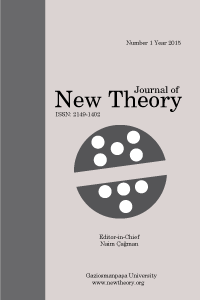 Journal of New Theory / 25 (October 2018): 50-58.